You hear of a night of Haydn conducted by the ever-sunny Nicholas McGegan, and you probably think, “That’s nice.” You notice that the Haydn Trumpet Concerto will be the centerpiece of the evening and you might say, “Hmmm, haven’t heard that performed in a while.” You realize that Alison Balsom is the trumpet soloist, and you drop whatever you had planned and you go. At least that’s what you should have done Tuesday night, but you probably didn’t. And that’s a damn shame. Judging by the relatively sparse attendance at the Hollywood Bowl, you weren’t the only one. Haydn apparently isn’t the draw that Beethoven or Mozart or Tchaikovsky is. Perhaps the sheer volume of his output waters down any individual work’s popularity, making an all-Haydn night less compelling to the masses. But if there’s one work that should stand out, it’s the trumpet concerto. Written as a showpiece for an instrument that in the composer’s time had just recently evolved to be able to play a full chromatic scale, it is compact, lyrical, virtuosic — what’s not to love? Part of the problem is that we just don’t hear it live often enough. As trumpet concertos go, the Haydn is bread and butter, but compared to concertos in general, it may as well be foie gras: rich and juicy, comes in small portions, damn hard to find. If memory serves, the last time the Los Angeles Philharmonic performed it was in 1995 when former Principal Trumpet Thomas Stevens was the soloist. In that time, there have been multiple performances of relative rarities like the Lutosławski cello concerto, the Korngold violin concerto, and Rodrigo’s Concierto de Aranjuez for guitar — don’t even get me started on the Lady Gaga-ish ubiquity of the “Rach 3” or the Mendelssohn violin concerto. But I digress . . .
On top of all this, you get Alison Balsom. If there’s a star among classical trumpet virtuosos these days, she is it (and, no, I don’t count Wynton Marsalis since he doesn’t really play classical music anymore . . . OK, maybe you’ve got an argument if you bring up Håkan Hardenberger, but still . . . ). Lastly, let’s not ignore the obvious — she’s got one thing you almost never find in a solo trumpeter: she’s gorgeous. Not that she over-sells that — or even really sells it at all — but in a part of the musical world dominated by men, having beauty combined with talent and taste certainly helps you to stand out from the crowd. (Given all that, I’m a bit shocked that a certain local music critic with a recent track record of drooling in print over the lovelies wasn’t there to a give his own lurid account of her visit. But, again, I digress . . . ). Tuesday night, Ms. Balsom walked on stage in a striking sleeveless, floor length dress, colored mostly in robin’s egg blue with impressionistic swathes of purple and green. Gasps and exclamations of “Wow!” were audible around me from men and women alike. She got to her spot near the podium, licked her chops, and got ready for work. Her playing of the Haydn concerto turned out to be masterful. She combined pinpoint accuracy with subtle grace and a rich tone. This wasn’t a blow-the-roof off kind of performance, but that’s not really what the Haydn concerto is about. When a moment called for volume — say, during her own stylish cadenza — she wasn’t afraid to cut loose and roar. More often, however, she kept her dynamics somewhere south of a comfortable forte throughout the work, easing into some entrances while attacking others. You couldn’t ask for much more. As if that wasn’t impressive enough, her encore was a beautifully slippery rendition of Astor Piazzolla’s, “Libertango,” arranged for trumpet and orchestra by Julian Milone. She bent notes and spun her way through runs, both with and without a mute, in ways that Papa Haydn could never have imagined a trumpeter could do. Mr. McGegan and the orchestra provided bright, sensitive accompaniment in the Haydn, and while I’ve certainly heard them swing with more ease than they did in the Piazzolla, they sounded in good form. Of course, there was much more Haydn that was played. Mr. McGegan is a regular guest on the LA Phil’s podium, especially when it comes to baroque and classical repertoire, and he curated a nice sampling of the composer’s oeuvre. The Symphony No. 30 in C major was a pleasant enough opening to the evening’s festivities. The three movement work showed the smaller contingent of players sounding in fine shape. After intermission, they played two works written during Haydn’s famously productive stay in London. Mr. McGegan gave a cheeky introduction, talking about how an older, still married Haydn found great happiness in the company of a Rebecca Schroeter, a much younger British widow, and how this happiness radiates throughout his London compositions. The cheery and rarely played Overture to Windsor Castle made his point well enough. The more popular Symphony No. 103 in E-flat major (“Drumroll”), with its somewhat brooding opening, seemed a less likely candidate at least at first, though in Mr. McGegan’s batonless hands, had more propulsion than it often has. By the time the main theme kicked in, all was warm and glowing, even sprightly, until all four movements ended. Nathan Cole, sitting in the concertmaster’s chair for the concert, played his prominent second movement solos with distinction, as did Ariana Ghez (Principal Oboe) and Demarre McGill (guest principal flute), and all were rewarded with foot shuffles from their on-stage colleagues at the movement’s end. With the reduced contingent of musicians, the LA Phil looked dwarfed by the Bowl’s recently enlarged shell. To help alleviate some of the visual and acoustic problems this may cause, three moveable panels were placed behind the orchestra. Mr. McGill, visiting from his regular gig as Principal Flute of the Seattle Symphony, has played with the LA Phil at the Hollywood Bowl before, but the last time he was here, he ostensibly had a shorter commute: at the time, he was Principal Flute of the San Diego Symphony. David Mermelstein wrote a very nice profile of Ms. Balsom in the Los Angeles Times earlier this week, and can be read HERE. One just hopes that he didn’t write the headline too, or perhaps I’m not in a punny enough mood to appreciate it. I couldn’t find a great way to quote Elvis Costello somewhere in this post, so in the end I just gave up, but now I’ve got “Alison” stuck in my head. Tags: Alison Balsom, Haydn, Hollywood Bowl, Nicholas McGegan, Piazzolla. Bookmark the permalink. Besides Balsom and Hardenberger, don’t forget that there is also one named Sergei Nakariakov. Example – http://www.youtube.com/watch?v=wdzZLCWeuwY&feature=related . Not bad at all! Ah, yes, of course. In addition, I have friends who are big Tine Thing Helseth fans. Of course not. Just like I don’t hold it against my friends for being “opera” fans whose favorite singers are Andrea Boccelli or Sarah Brightman or Il Divo. . . . OK, maybe I hold it against them if they’re Il Divo fans . . . If we agree to call those two “great players”, it would not be because of the fact that they could play the concerto, but because of HOW they played it. 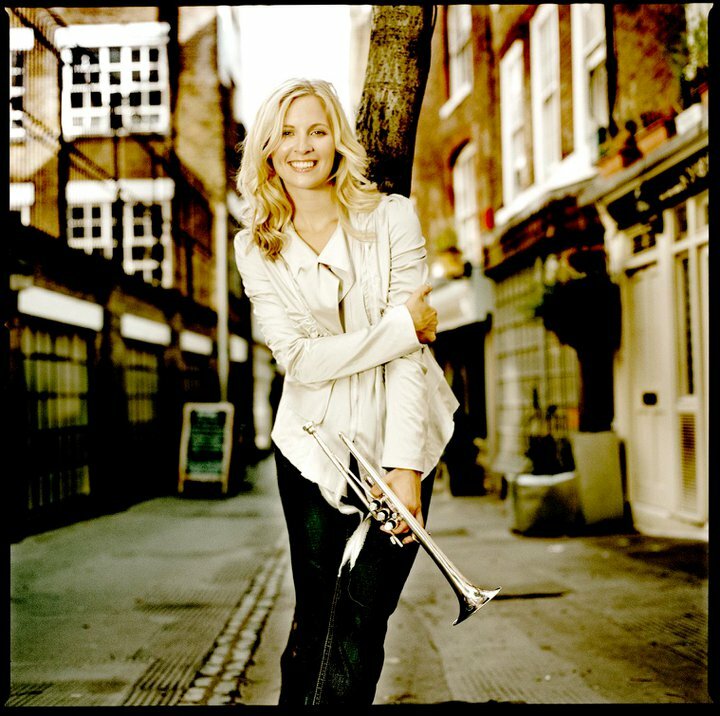 Never seen Tine Thing Helseth in person, but, judging by a few of her recordings that i heard, she is probably a very good trumpeter. Can’t tell exactly how good without hearing her live, but just want to point out that a “more lyrical” Haydn is not necessarily a better Haydn. In any case, all comparisons of one musician’s recordings with another’s live performances are inherently flawed and therefore largely pointless – unless of course the differences in the musical quality of aural evidence are huge, but that does not seem to be the case here.